It's the season of top 10 countdowns, so I couldn't help but participate in the annual tradition and reflect upon the ten most glorious meals I consumed during 2010. With a lot of thoughtful consideration and several close calls, I've managed to assemble a list of the most memorable, sensational, and tantalizing dining experiences I've enjoyed over the past 12 months of culinary expeditions and adventures. During my first-ever visit to Portland last February, I knew this city would be a mecca for foodie finds. Portland is a leader in the farm-to-table movement, home to many of the finest coffee roasters, and it proudly boasts one of the first fleets of gourmet food trucks. There was one restaurant that caught my eye immediately: Andy Ricker's Thai restaurant, Pok Pok. The ambiance of this restaurant is literally homegrown—Pok Pok started as a rotisserie stand selling lemongrass chicken out of Andy's garage, and it rapidly grew to take over his entire house. The chef's mission is to serve the most delicious Thai cuisine from various regions across Thailand. He says that most Thai food restaurants “Americanize” their food due to the lack of traditional Thai ingredients available in the States. Andy's goal is to not compromise the flavor of the original recipes and has figured out many creative ways to duplicate his favorite dishes from Thailand. For example, Thai limes have a different taste to them than the limes found in the US. So to help recreate the flavor, Andy often adds a squeeze of orange juice to the limes to give it the sweetness of a Thai lime. Papaya pok pok:Their namesake dish, papaya pok pok, is spicy and sweet and smothered in a tasty, light dressing made of fish sauce, palm sugar, tamarind and lime juice. It’s tossed with tomatoes, long beans and peanuts. The sweetness of the palm sugar, the tartness of the lime juice, the tanginess of the tamarind and the nuttiness of the peanuts ensure that not a single taste bud is left out. Fish sauce wings: These sweet and savory wings are marinated in fish sauce and palm sugar, deep friend then tossed in more caramelized fish sauce and garlic and served with a refreshing Vietnamese salad. They are some of the best wings I've had. Their quality puts them in the esteemed company of Koreatown's Kyochon and Sawtelle's Furaibo. It's not often you happen upon a small town where every member of the community is an expert on the complexities of wine characteristics and can speak intelligently on grape varieties from Bordeaux’s to Zin’s and even Petit Syrah’s. Unless of course, you're somewhere on the central coast of California. One of my favorite getaway destinations within driving distance of LA is Paso Robles. This quaint town with its cultivated art community and picturesque town square looks like a Normal Rockwell painting brought to life. Best of all are the hundreds of vineyards that produce some of the best wines in the state. And with good wine, comes good food. The restaurant Artisan arguably holds the number one spot in Paso Robles. It boasts an amazing wine list, many of which come from small wineries that only distribute within Paso Robles. The menu at Artisan is of equal caliber. I would be dining here more often if it wasn't a four hour drive for each meal. The broccoli and cauliflower: This dish is roasted in lemon, olive oil, garlic and dried chili and served hot in a cast iron baking dish. So simple but perfectly cooked and seasoned. I've recreated this dish many times, including Thanksgiving dinner, and it's always a hit. Sea bass with lobster ravioli: Served with candied fennel and cipollini, the fish was perfectly cooked, and the flavors simple and delicate. I've dreamt of this dish several times since consuming it. No city in the US does Italian food better than New York. In fact, I think some of the best Italian restaurants in NYC could rival some of the best in Rome, Florence and Milan. If such a competition were to take place, midtown's Basso 56 would definitely be a contender. Located on 56th Street and Broadway, Basso (which translates to below) is located in a narrow intimate space a few steps below street level. Chef Paolo Catini is not trying to reinvent the wheel by offering Italian fusion or overtly contemporary dishes. While his food is both creative and bold, it stays true to the traditional Italian cuisine he grew up with. A trademark of this restaurant is not only the culinary experience but the welcoming atmosphere. We celebrated my mom's 60th birthday at Basso last May and the service could not have been better. Expect a warm greeting and fond farewell from the entire Basso crew. It's one of my favorite places to dine in all of New York. Most Angelenos can agree with me on the simple fact of life that Mexican food is one of the tastiest cuisines in the world. In LA we are blessed with an abundance of authentic Mexican restaurants, trucks, stands, and other eateries which have become an integral part of the city’s culture. When I made my first trip to Mexico City this past November I was excited beyond belief to visit the source of some of my favorite culinary fascinations. Luckily I was there visiting one of my best friends, Elena, a Mexico City native and a newly minted telenovela starlet. She took me to her favorite restaurant, Dulce Patria, which exceeded my already high expectations. Dulce Patria is the vision of chef Martha Ortiz, who has taken regional Mexican cuisine and modernized it into a contemporary culinary experience that certainly plays homage to its roots. Crema de flor de zucchini: I had the most delicate and exquisite soup made from zucchini flowers. Ceviche vamprio: I am a huge fan of ceviche of any kind. 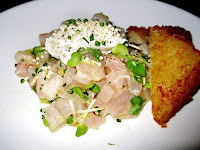 Usually, it’s the Peruvian varieties that I am most inclined to seek out, but the vampire ceviche at Dulce Patria was something to remember. It's served with coconut and red prickly pear, giving both a splash of the "vampiro" red color and a flavor combination that will rival any other ceviche. Most Japanese food enthusiasts are a fan of izkaya, which has become increasingly popular over the last few years. Places like Izkaya by Katsuya on 3rd Street, Itacho on Beverly, and Furaibo on Sawtelle are all worthy establishments where you can find a wonderful selection of sakes and indulge in your favorite Japanese bar foods. My favorite izakaya spot I tried this year, however, was in the basement of a nondescript office building near Grand Central Station in New York: Sakagura. 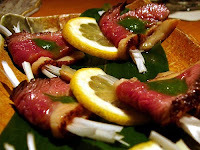 Kamo roast: Thin slices of perfectly cooked, juicy duck wrapped around scallions and accented with a basil sauce. Sanshoku nasu dengaku: My favorite item on the menu was the eggplant sampler. The eggplant was roasted and served in soft, bite size portions and topped with three different miso sauces. One was derived from eggy olk, the second from spinach and the third from sweet red miso paste. The sauces were each more delicious than the last. There is no way I could duplicate this recipe at home, which means there will definitely be more trips to Sakagura in my future. I also have to give an honorable mention to the black sesame creme brulee, which is a brilliant idea, and an incredibly satisfying dessert. From the first time I tried the Laxy Ox last January to my most recent trip last week, the downtown eatery has never let me down. It's become one of my favorite and most frequently visited restaurants in LA. With a rotating menu offering new dishes at each visit, I never get bored. The Lazy Ox’s chefs, Michael Cardenas and Josef Centano, add more creativity and boldness to their dishes than just about anyone cooking in LA right now. Their contemporary menu is influenced by French, Japanese, Mexican and Catalonian cuisines, just to name a few. They are not afraid to take chances, and I'm always thrilled to try whatever newest innovation is being served up at their dining room in Little Tokyo. Dashi marinated yellowtail: I order this pretty much every time I go to the Lazy Ox. The fish is so fresh and coated in a delicious sauce made with avocado, citrus and small black seeds called tonburi which have a texture similar to caviar. 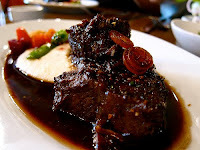 Braised beef paleron: The paleron, which is a similar cut to a pot roast, is served on top of cream of wheat, kumquats, and red wine. Who would have ever though that cream of wheat could be paired so deliciously with braised beef? They figured out something magical here though, because it's magnificent. No knife necessary. Celebrity Chef Marcus Samuelsson just recently opened the newest addition to his empire, Red Rooster, in Harlem. Each dish at this soul food restaurant has hints of Samuelsson's own roots—he was born in Ethiopia and raised in Sweden. The chicken and egg, for instance, was a take on the classic Ethiopian dish, doro wat, and the presence of ingredients such as lingonberry are definitely inspired by Scandinavian cuisine. When I arrived during the NYC blizzard a few weeks ago, the incredibly welcoming staff was ready to take our jackets, seat us and serve us a complimentary glass of glogg (mulled wine) before the meal. Red caesar: The best caesar salad in memory. It’s made with only red and purple salad greens, and each bite pops with a light smokiness from the herring in the vinaigrette. Fried yard bird: This huge serving of fried chicken is crispy perfection in a sweet and spicy batter. It was accompanied with a jar of “shake” so that you can reapply the magical seasoning to each bite once you've passed the surface. This is how fried chicken should always be done. Samuelsson has set a new standard. I've already written an entire post on Ludo and his fabulous Ludo Bites 6.0 so I won't rehash all of the details. All I'm going to say is I'm ready and waiting for his newest incarnation! Read our post on LudoBites! La Sostanza is the oldest trattoria in all of Florence. It was opened in 1869 and has become famous for serving up traditional Florentine fare better than anyone else. Diners eat on long wooden communal tables at this tiny, no-frills establishment that has been aptly nicknamed “the trough.” While I got to experience so many incredible meals in Italy, this was the most memorable of all. Petti di pollo al burro: They are famous, rightfully so, for their chicken breasts, fried in butter and served simmering hot straight out of the oven. 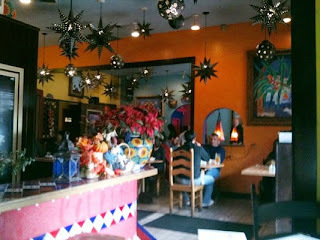 My number one meal of 2010 was at the Mexican restaurant, La Fiesta in Mountain View, California. During a very long shoot one day in March for my documentary film, I came here with my co-producer Regina, completely famished and ready to fall asleep. The owner, Lucy, was so inspired by our story and our project (www.doyoudreamincolor.com) she sat us down, introduced us to her family (who happened to be hanging out and dining at the bar), and told us she would take care of us. She served up her famous dishes that were recipes handed down by her grandmother. This unassuming, charming Mexican restaurant provided the warmest hospitality when it was greatly needed and one of the most delicious meals in recent memory. Lucy sent us home with to-go boxes for the rest of the crew and a few servings of the best coconut flan I've ever tried. 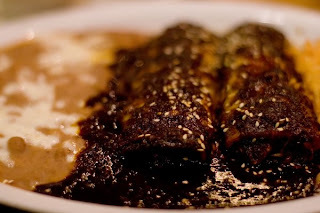 Enchiladas especial de mole: It's no secret that mole is one of my absolute favorite things to eat. 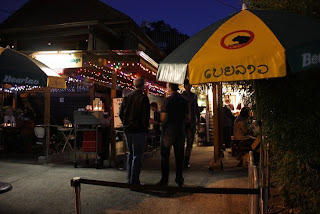 I've been to mole festivals, have eaten tons of homemade mole (red, green, black...) and even spent my birthday at LA's famed Oaxacan restaurant Guelaguetza (read our post!). The mole at La Fiesta, remains one my absolute favorites. It's made exactly how I like it: rich, nutty and dark, with hints of chocolate and spice. Happy New Year, I wish you all many delicious meals in 2011! NEXT TIME on Foodie Fridays: Decadent waffles and some fantastic coffee creations at Beverly Blvd. 's Shaky Alibi.